Up to 1,400 Air Berlin employees could be out of a job by the end of October. FRANKFURT AM MAIN - Bankrupt German airline Air Berlin must ground all flights by the end of October, the firm said Monday, as talks continue with prospective buyers Lufthansa and Easyjet. Flights "will as far as we know no longer be possible after October 28 at the latest" because of insolvency rules, chief executive Thomas Winkelmann wrote in a letter to employees. 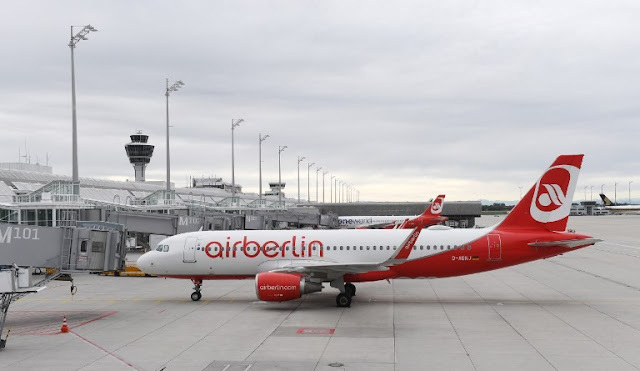 Air Berlin triggered bankruptcy proceedings in August after losing a cash lifeline from its biggest shareholder Etihad Airways. Its aircraft have been kept aloft by an emergency loan from the German government. Subsidiaries Niki in Austria and LGW in Germany are not themselves bankrupt and will be able to continue flying after the late October cut-off. Meanwhile, Lufthansa and British carrier Easyjet's exclusive deal for talks to buy up chunks of the stricken airline ends Thursday, and any agreement will need a green light from European authorities -- a process that could take "several weeks or months," the firm expects. "We will know more in a few days" about any agreement, Winkelmann said, adding that negotiations had been "intense". Unions have criticised management for not keeping some 8,000 employees informed of the progress of discussions. Also on Monday, executives and worker representatives opened discussion of a redundancy programme. Many Air Berlin workers are expected to find new jobs at the prospective buyers, and Lufthansa has already advertised around 1,000 new jobs at low-cost subsidiary Eurowings, expected to buy up many of the smaller airline's planes. Nevertheless, "we strongly encourage you to actively take a look at the job market yourselves," Winkelmann told staff. A union document seen by AFP Saturday suggested up to 1,400 Air Berlin employees could be out of a job as soon as the end of October, with cuts falling especially heavily among ground crew and administrative staff. Bankrupt German airline Air Berlin must ground all flights by the end of October, the firm said Monday, as talks continue with prospective buyers Lufthansa and Easyjet.